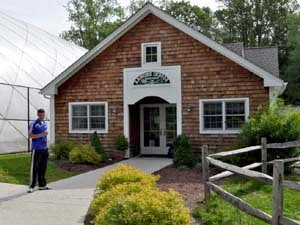 Doug Sherman is the Tennis Director for Armonk Tennis and Armonk Indoor after holding the Senior Professional position at the Saw Mill Club from 2002 to 2008. In addition, he was the Head Professional at Seven Bridges Field Club in 2002 and 2003, and at Chappaqua Swim and Tennis from 2004 to 2007. Doug has also been involved with the USTA as a Recreational Coaches Workshop Trainer and the Competition Training Center Head Professional. Doug received his BBA in Hospitality and Tourism Management from James Madison University in 2001 after being named the school's Outstanding Scholar Athlete in both his junior and senior years. He reached PTR Professional standards in 2002. Greg Anderson joined Armonk Indoor in 2011 and became Academy Director in 2015. He is originally from Johannesburg, South Africa, where he began playing tennis at the age of four. He competed in national tournaments throughout his junior career and climbed to the top of the rankings in the U12 through U18 age groups. He was then recruited to play Division 1 tennis at the University of Kentucky and later Morehead State University, where he earned First Team All-Conference, Team MVP, and Academic Recognition honors during his career. He holds a bachelor's degree in Exercise Science. Professionally, Greg has also acted as hitting partner and strength trainer for his brother Kevin Anderson, who has reached a career high of #5 in the ATP World Tour rankings. This experience has made him very aware of what it takes to succeed at the highest level and what aspiring tennis players should work on to get there. Jaklin Alawi comes from Sofia, Bulgaria. As a junior, she was ranked as high as #170 in the ITF and #800 in the WTA. With three ITF junior singles titles and two doubles titles, Jaklin was the top-ranked U16, U18, and women's player in Bulgaria. She placed seventh in the European Summer Cups in both the U16 and U18 divisions and went on to lead the Bulgarian Fed Cup team. Pursuing a college career in the United States, Jaklin began at Long Beach State, where she was the 2010 Big West Freshman of the Year and a two-time All-Big West selection while helping the team to its eighth appearance in the NCAA Tournament. She then spent two years at the University of South Carolina, earning All-SEC second team honors twice and reaching a national ranking of #33 in singles. As a senior, she was named team MVP before graduating with a degree in Political Science. Jaklin has extensive coaching experience to match her playing experience. She was the assistant coach of the women's team at Florida International University, taking the program from unranked to #42 in the ITA 2016 rankings. The team reached their conference finals and had victories over top-40 teams Yale and Georgia State. Jaklin has also trained top-flight ITF juniors and women on the WTA circuit. Sherzod Akramov was born in Tashkent, Uzbekistan. He came to the U.S. to play collegiately at the University of Mount Olive, where he was both an athletic and Presidential (academic) scholarship recipient. As a junior, Sherzod was a member of the All-Conference Academic Team, as his team won the regular season and conference tournament titles. As a junior, he reached #848 in the International Tennis Federation Junior Circuit. Active outside of tennis, Sherzod served as president of the UMO International Club and supports fundraising efforts for people both in need and with disabilities. Richard Callwood is originally from England, where he grew up playing junior tournaments. Upon coming to the U.S., Richard attended SUNY Purchase College, double majoring in Math/Computer Science and Economics. Richard then pursued an even higher degree of education, obtaining his Masters in Economics from Fordham University. After a stint in the corporate world, Richard decided to go back to his passion by coaching tennis. He taught at Saw Mill Club from 1989-2009 and was the Head Pro at Lakeside Field Club for a number of years. Richard has Professional level accreditation with both the USPTA, where he scored in the 95th percentile, and the USPTR. He still loves playing in tournaments and has achieved a #1 singles ranking in the USTA Eastern Section and a National singles high of #36. In the summers he is the Tennis Director at Quaker Hill Country Club in Pawling, NY. Marc Farrell grew up in Pleasantville, New York, where he began playing tennis at the age of five. He competed in numerous tournaments as a ranked junior until graduating from Byram Hills High School. While at Byram Hills, he played on the varsity team for all four years and was captain during his junior and senior years. He then graduated from the University of Rhode Island with degrees in Sociology and Business. Marc has been working at Armonk Tennis since 2010. As a certified teaching professional, he loves teaching players of all levels, from juniors to adults. His previous coaching experience includes being the Assistant Head Professional at the Whippoorwill Club for four years. Currently, he is also the Director of Armonk International Tennis Academy's junior summer camp and coach of the Northern Westchester Junior Tennis League team. Matthew Finnerty is from Warwickshire, England. At 16 years old, he was accepted into the Sutton Tennis Academy. He then played collegiately at Mount Olive University in North Carolina. During his career at MOU, the team reached a national ranking of #24, won the conference championship twice, and made it to the final round of Regionals. On a personal level, Matthew achieved a #38 ITA National Singles Ranking and holds school records for most wins and longest undefeated streak in conference play. He was named Conference Carolinas MVP in 2014 and 2015. Matthew graduated with a Bachelors Degree in Leisure Service Management and is pursuing his MBA in Sports Business Management. Prior to joining Armonk Tennis, he worked at Pine Hollow Country Club as a teaching pro and Assistant Director of the tennis program. Jan Holaday is a graduate of Union University in Tennessee, where his successful tennis career included reaching the national quarterfinals as a freshman. After graduating and spending six years in the corporate world, Jan made the decision to pursue coaching as a career path. He obtained certifications by the USPTA, USPTR, and USTA Sports Science, as well as the USRSA (racquet stringing and repair). He began as the Director of Tennis at Manhattan Plaza Racquet Club in New York City before being named Senior Head Professional at Grand Slam Tennis in Bedford, NY, where he ran the junior and tournament-level programs. After 14 years at Grand Slam, he came to Armonk Tennis and Armonk Indoor and was part of the creation of Armonk International Tennis Academy in 2008. Having coached six juniors who eventually played ATP and WTA tournaments, along with dozens of Division 1 NCAA players and hundreds of USTA nationally/sectionally ranked players, Jan is confident in his ability to take any player to the next level. Originally from Zambia, Africa, Webster Munyenyembe trained for nine years at the ITF Tennis Center in South Africa. He was a highly ranked national junior player, played on the ITF Circuit for three years, and was a member of the Zambian Davis Cup team. He moved to the U.S. to play collegiately, first at Graceland University and then at Iowa State, where he graduated with a degree in Computer Engineering and Science. After working for a few years in a profession related to his major, Webster decided to return to his passion of coaching. He is a certified PTR and ITF professional and recently worked at Pelham and Brae Burn Country Clubs. He is well versed in the USTA Quick Start program and has extensive experience working with high-performance juniors. Angus Thomson is from Brisbane, Australia. He began playing tennis at 5 years old and became one of the top junior tournament players in Australia. After deciding to pursue an education in the U.S., Angus played for two Division 1 programs. He played his freshman season at the University of the Pacific in Stockton, California, holding the #1 doubles spot. Angus then transferred east to Robert Morris University, where he played three seasons at the #1 singles and doubles spots. In addition to being a strong junior and collegiate player, Angus has much experience coaching all levels, from pee-wee through adults. He spent two years at Lifetime Tennis Academy in Brisbane and is presently the Assistant Tennis Director at Future Stars Summer Camp at Purchase College SUNY. Upon graduating in 2001 with a BSc in Sports and Exercise Science, Stuart moved to the United States from England to pursue a career in professional coaching. He currently holds the NSCAA Premier Diploma, Advanced National Diploma, and the National and Regional Goalkeeping Diplomas, along with the English Football Association C-License. 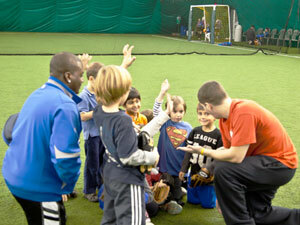 Stuart is the head of training and professional development for the Armonk Indoor coaching staff. Stuart is committed to the development of soccer at various levels. He has set up and coached in various Academy, Travel and Premier soccer programs across Fairfield County. Stuart has also been the Girls JV coach at Greenwich High School since 2003. In addition to directing Armonk Indoor's league and tournament events, Karl coaches for New York Soccer Club, a member of the United States Soccer Federation Development Academy. He is also director of coaching for Westchester's Armonk United and Castleford Rovers clubs and ran the Future Stars soccer camp from 2011-15. Karl played soccer at the collegiate, county, and semi-professional levels in Ireland. He graduated from Letterkenny Institute of Technology in 2009 with a Business Degree in Sports Development and Coaching. Having begun his coaching education in 1999, he has gained various qualifications through the FAI, USSF, and NSCAA. He is an avid Crystal Palace supporter. Adam has over 20 years of experience coaching various levels of youth, travel, summer camp, and high school lacrosse. He has built an extensive network of lacrosse contacts, many of whom are currently coaching at the elite college level (Dartmouth, Princeton, etc. ), and has successfully managed the college recruiting process for many players. In 1995, he helped coach Byram Hills to the Section 1 championship and handled the recruitment of his senior captain to Harvard. As a player, Adam was a first team NCAA All-Conference selection and a member of Team Toyota's elite team. Adam believes young players should find the balance between working hard at lacrosse and enjoying the game. Rachel has 15+ years of experience coaching various levels of youth, travel, summer camp, and high school lacrosse. She was a four-time letter winner at Cornell University, where her team was ranked in the top 10 nationally all four years. As a senior, she was named team captain and was selected to the All-Ivy and Regional All-America teams. Rachel is currently the Director of Brant Lake Sports Academy, a unique summer camp for motivated, sports-loving girls ages 11-16. She lives in Armonk with her husband and three kids.